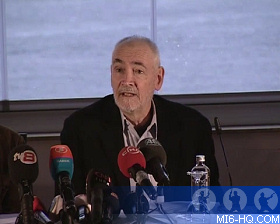 Yesterday, producer Michael G. Wilson was joined by Ali Akdeniz of the Anka film company (which is responsible for the filming in Turkey) to address a multitude of press stories that have carried some serious inaccuracies over the filming of "Skyfall" in Istanbul. 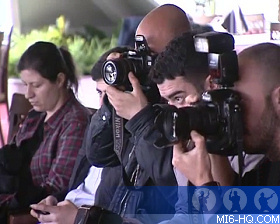 The crowd of two dozen journalists and a host of photographers were given detailed explanations of how some of the misconceptions have arose. The production team have endured a number of false stories in the media, and some sensational fiction that not even the British tabloids would believe. Answering the key criticism that has been unfairly leveled at the production, Wilson reasserted that it was a priority of the production to leave places better than they found them. "We have previously shot in cultural places in many countries. We pay great attention to not cause any damage to such places,” he said. "Even before we came here we filmed at the National Gallery in London, and in all of the places, we've always come away with a good feeling and all of the people seemed to be happy to welcome us back. So, hopefully, we can maintain that feeling here in Istanbul and across Turkey," he added. On the subject of a particular motorcycle stunt that appeared to have smashed a window and damaged a building in the historic Grand Bazaar, Wilson explained: "If you go back a week or two after we leave you'll find there is no building there at all. We built that entire building, but I have to say, I was up there today and I was convinced it was part of the site - but it was actually our own construction. Similarly, when you go back and look at the window that the motorcycle came through in the Grand Bazaar, you'll see that it's actually a very tall opening and we've made it smaller and put in a window - it's our own window [that was damaged during filming]. It's all part of us being illusionists. This is what the art of cinema is." But Wilson also said the stunts were not always successful, and that one of the stuntmen (doubling the villain), who was driving a motorcycle, accidentally broke a real window of a shop in the Grand Bazaar. The shop owner has not yet accepted the proposal to compensate damages, but a positive answer is expected, he added. Another topic of controversy in the Turkish media was the supposed damage being done to rooftops in Istanbul by the filming of a motorcycle chase. Wilson said the motorcycles were actually moving on platforms that had been placed on the roofs, at a cost of 135,000 Turkish liras. Original roof tiles were carefully removed and boards of synthetic tiles were put in place for the filming, before the originals were later replaced. The media were shown this work up close yesterday in an attempt to put an end to the story. 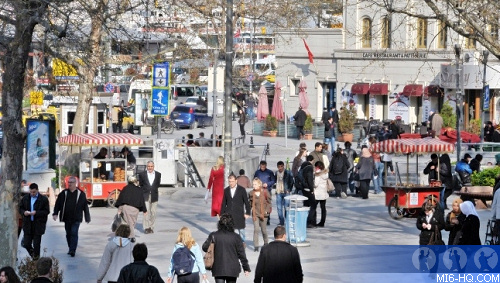 Grand Bazaar Tradesmen Association President Hasan Firat earlier told press that all necessary precautionary measures had been taken and permission granted by the Council of Monuments, the Istanbul Municipality and the Ministry of Culture and Tourism. "The movie will generate incalculable revenue for our country by advertising Turkey," he said. Ali Akdeniz said they had made a big effort to carry the project to this point. “The reason why the film is being made in Turkey rather than any other country is that the natural environments here have not been used in any other big project before, as well as the promises given by relevant ministries.” He said preparations for filming had begun as long as eight to nine years ago. Just a day before the press conference, the media was hyping up supposed complaints from anonymous business owners around the Bazaar. "I did not want my store to be part of the movie because I am pretty certain it will show Turkey as the home of the bad guy James Bond is after," one said. "I saw they had decorated the bazaar with types of things we don't sell here," another said. Speaking about the claims that the decoration used in the market place did not accurately reflect Turkey, Akdeniz said viewers would see the Egyptian Bazaar, the New Mosque and the beauties of the streets, rather than the market place. 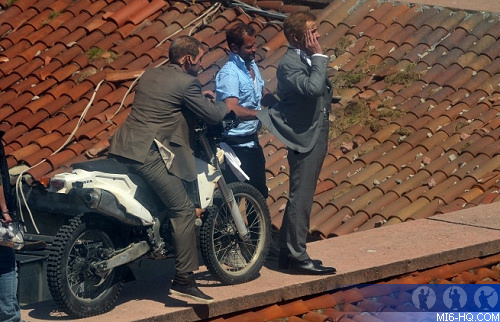 Daniel Craig arrived in Istanbul yesterday, and would be staying on for three three weeks of filming. Other members of the cast, such as Naomie Harris, were scheduled to be in the city for five weeks. Wilson added that Turkish actors would perform in the scenes shot in Fethiye, and that there were some 250 Turks in the filming team.